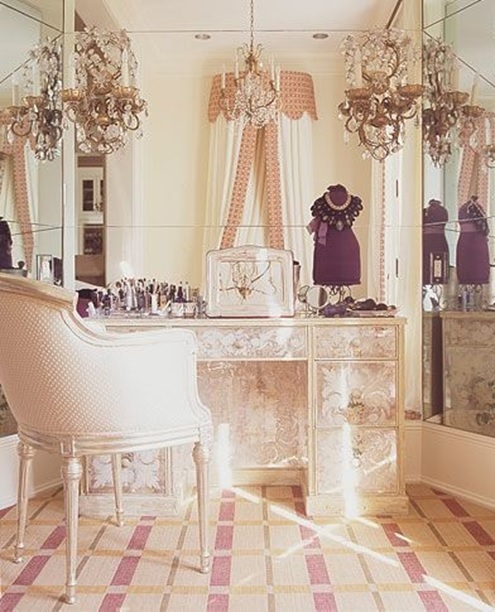 This is second in our three part series on how to turn your closet into a fab dressing room like celebrities have. Yes, this topic is so important that it warrants a series to explain it :). But also we are including lots of photos in this series and since they take up a lot of space we thought it was better to break up the article. A bedroom closet used to be just a utilitarian place to hurriedly grab something clean off a hanger and then get going with the day. But interior designers are transforming closets into incredible dressing room spaces that rival a luxury boutique store. Our Pinterest board, called My Glam Closet has a mannequin, showcases a variety of styles of dressing room spaces – something for every budget. We show tiny spaces like a converted armoire and renovated attics as well as “closets” which are entire rooms complete with seating, fancy wallpaper and chandeliers. This HGTV post has 21 different ideas (from the simple to the extravagant) for turning a generic walk-in closet into a luxurious storage space. The reason why we became interested in the closet makeover trend is because we had discovered the mannequins are becoming a “must have item” people transforming their a closet into a dressing room. And we noticed that more of our new and used mannequins were being purchased by interior designers and private individuals instead of our usual retail store owners. Typically people prefer a dress form over full size mannequin for home use. Dress forms are ideal for modeling the next day’s outfit or displaying a favorite item that you don’t wear very often but enjoy looking it. And many women love to display their jewelry instead of putting it in a drawer, so they use jewelry forms like you would find in a retail store in their dressing room area. Or a mini jewelry form on their dressing room table. If you want a dress or jewelry form for your dressing room, we have them at MannequinMadness.com. See tomorrow’s post about the 10 most popular items designers are buying from us to put in dressing rooms. And see yesterday’s post with 4 tips on how to turn you closet into a fab celebrity style dressing area.